Our Bed & Breakfast is located in Mestre, Venice. 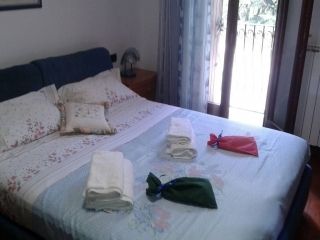 Ideal for one person or couples who seek the relax and quiet area of our lovely Venice. We have two rooms in our B&B. This Double room has a double bed, safe box, wardrobe, small balcony and TV. Ideal for couples. There is also possibility to add one more single bed. Max 3 guests. You have access to a bathroom, living room, and garden with a season swimming pool, seating area, trees. This room has a small balcony.